New York: HarperCollins Paperback, 1991. 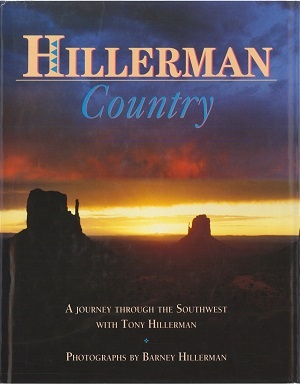 This is the first edition hardback edition of Hillerman Country, a photo-book that explores the southwest with Tony Hillerman's text and Barney Hillerman's photographs. This 1991 edition was published by HarperCollins Publishers in New York City, New York. The cover features a sunset photograph of Monument Valley taken by Barney Hillerman. Format: Hardback, 31.6 x 24.5. Binding: Red boards and spine with the title, authors, and publisher's logo.